At first, they were imitating Felix the Cat, reigning superstar of animation. Later, they were imitations of Mickey Mouse, the new reigning superstar, who, himself, had been designed to look like Felix with mouse ears. 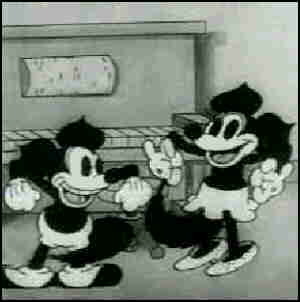 Foxy, an early Warner Bros. entry into the milieu of animated characters, was perhaps the leading Mickey Mouse imitator. No, he didn't lead in popularity or longevity or prominence or anything like that. Far from it! He appeared in three cartoons, which audiences didn't seem very interested in, and he'd be forgotten today if anybody had known he existed in the first place. Where he led was in the blatancy of his imitation. Never in animation, before or since, has a character looked more like Mickey Mouse. Smooth out the tiny points that supposedly turned his big, round ears into fox ears, shave the bushiness off of his tail, and they were ringers. Do the same to his girlfriend (unnamed at the time), and she looked exactly like Minnie. They also acted like Mickey and Minnie did at the time. Despite this lack of originality, Foxy was the first character to originate at Warner (as opposed to being brought in from outside, like Bosko). Foxy was introduced in the very first Merrie Melody, the companion series to the Looney Tunes (both titles swiped from Disney's Silly Symphonies, of course). The director of record was Rudolf Ising, but the hands-on directing seems to have been by Frank Marsales, the studio's first musical director. The Merrie Melodies were later devoted to non-recurring characters, but not only was Foxy there at the start, a couple of other small-timers, Goopy Geer and Piggy, followed. It was released during August or September, 1931 (sources differ). Foxy went on to star in the second and third Merrie Melodies, Smile, Darn Ya, Smile! (released September 5 of the same year) and One More Time (October 3). In them, he played a saloon patron, a streetcar conductor, and a prohibition-era policeman, respectively. Reportedly, he was dropped because Walt Disney personally asked Ising to do so. Two more Foxy cartoons had already been animated, so his replacement, Piggy, was designed as a slightly less obvious Mickey clone so as to make substitution easier. And that was very nearly the end of Foxy. No comics, no noticeable merchandising, no more cartoons — Foxy went through his entire career in only a few weeks. History is silent on who did his voice. But a half-dozen decades later, he and his girlfriend (here dubbed Roxy) turned up again. In the Sept. 28, 1992 episode of Tiny Toon Adventures, titled "Two-Tone Town", the pair of them (redesigned to look less Mickey-like), along with Goopy Geer (Piggy, who scarcely counts anyway, didn't make it), met Babs & Buster Bunny. Here, their voice artists are known — Foxy was Rob Paulsen (Yakko Warner) and Roxy was B.J. Ward (Casey in Snorks). Other than that, it's been oblivion for them since the black and white days. Text ©2006 Donald D. Markstein. Art © Warner Bros.